I’ve always been fascinated by the subconscious part of our brains. From reflecting on the predominance of tacit (versus explicit) knowledge during my Doctoral studies in virtual communication, to our work in design thinking the past 10 years, where methods are used to uncovers deep-lying needs. Though the value of subconscious thought and action for success in executive life may be recognized, the heavy weighting of it in comparison to our conscious selves is what surprises many. Gerald Zaltman, a professor at Harvard, posits that conscious activity represents only 5% of cognition. And much has still to be discovered within this hidden 95%, giving us much to explore in the domain of habits for health and performance. Thinking and decision-making are natural areas of analysis in the working context. Though some of the studies may be questionable, a quick “wisdom of Google” search puts our daily decisions at more than 30,000, with only 70 of those being conscious. Certainly of more reliability is the work of Nobel Prize winner Daniel Kahneman who writes on two systems of thinking, Fast or System 1 thinking which is the subconscious part of our brains and much more frequent, and Slow or System 2, our conscious self which is much less frequent. It is clear that we need both, and that without habits we’d be unlikely to proceed very far in our daily lives, if for example every single decision were to be slow and conscious. We believe that habits in the workplace can have a significant impact on the organizational as well as individual level. Habits form routines and behaviour, which when aggregated on a team level can form culture. Although we may perceive certain behaviour as good or bad in others, it is not always so clear-cut for ourselves. When we create a habit the brain stops participating fully in the decision making process, and the brain doesn’t distinguish between “good” and “bad” habits. Within this context we had an interest in how good habits are formed. A total of 1900 senior managers at Telefónica attended a Sustaining Executive Performance course at the Corporate University during 2016. In short sessions spread over three days, content was delivered on the “WHAT” of executive health, including mobility and exercise, sleep, mindfulness and nutrition, and the “HOW” of making good intentions stick with basic instruction on successful behavior change. At the end of their course they wrote a self-addressed letter outlining a new positive habit that would improve their health and performance. This letter was mailed to them 100 days after the end of their course. On the letter was a link to an online form with two questions. An e-mail reminder was then sent to all to complete the questions. The first question asked the degree of success on a scale from 1 to 5, where 1 was having “completely forgotten about the commitment until the letter arrived” and 5 having “a new automatic daily habit”. The second question asked the respondent to choose from a list of 4 choices on where and when the habit was placed; 1) in the morning before arriving at work, 2) in the morning at work, 3) at work after lunch, and 4) in the evening after leaving work. We achieved a response rate over 30% and a total of 574 answers. Our questions were designed to gain insight into two key variables for habit formation success; the environment and the time of day. Although we didn’t have well-formed hypotheses prior to the study, we did have some expectations based on other research in the field as well as our own leadership development experiences. For example, regarding the time of day variable “decision fatigue” research has found decision-making to worsen as the day has proceeded. Other studies have shown both the likelihood to follow rules and even ethics to decrease over the course of time. Our expectation was therefore that the most successful habits would have been placed in the morning. The importance of the environment, in our case either home or work, also provided an interesting variable. Environment design is a key part of our work at The LAB and this column has included articles on both the physical and social environment in recent months. We would expect the home environment to be more “designed,” that is, shaped proactively by the respondent. Whether such changes would support good or bad habits is, however, open to question. 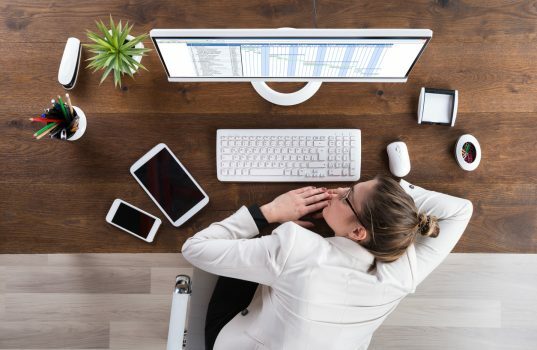 The work environment design in contrast would be more out of their control, though it may offer greater discipline to follow through with habits in the health domain. In any case our expectation was that the home environment would offer a better opportunity for habit formation success, also because they would be more focused on their personal lives, with healthy habits still perceived by many as a non-work topic. The results of the placement of habits are shown below and reflect our expectations. There is approximately an 80/20 split between home and work habits with a more even distribution between morning (53% of sample) and evening (47% of sample). The success of habit formation produced one or two surprises. Although we see success (as expected) in the morning what we didn’t expect was the most successful slot to be at work after lunch. This is the smallest part of the sample but still worthy of further reflection. It could be that lunch has provided an additional energy boost for habit effort, consistent with some of the work in the decision fatigue field. Perhaps also with work priorities having been taken care of in the morning, the afternoon allows more space for thinking on self-improvement. In any case, we see an opportunity for greater attention to habits in the work environment, where only 20% of our sample chose to place them. With increasing attention to workplace design an accompanying belief from the employee that their work environment offers a supportive space for positive behaviour change may impact greatly on health and performance. We will continue to look at this as we analyze this sample and others in the coming months. Steven is a business school professor and researcher with experience at Stanford, Carnegie-Mellon, IMD, IESE, CEIBS and IE. He has taught over 20,000 executives through the Sustaining Executive Performance program, also a book published by Financial Times Press in 2015, and serves clients including McKinsey and Salesforce through The Leadership Academy of Barcelona. His new book, Chief Wellbeing Officer, was published June 2018.